With Hako Citymaster 90 you can ensure quick, economical cleanliness – all whilst sitting comfortably. Even in restricted applications the Hako Citymaster 90 is in it’s element and in such areas it shows all of its power and efficiency. 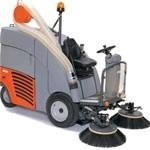 The convincing ride-on alternative to pedestrian operated machines for municipal outdoor cleaning. Highly manoeuvrable as a result of the new hydraulic rear wheel steering. Ergonomically optimized workplace, simple to operate. Excellent view of the area to be cleaned. Particulary economical machine life costs. Clean dirt up-take as a result of the two large plate brushes and powerful vacuum turbine. The newly developed dry filter system cleans the used air with a degree of separation of 99,5%. Handy disposal system: debris can be emptied quickly and easily via high dump facility into standard rubbish bins or containers. Clean Water Tank 100 lt.